The following are some of the ways patients have described the pain from a neuroma: “It feels like I’m stepping on a pebble,” “I feel like my sock is wadding up under the ball of my foot,” “I feel a burning pain between my toes,” and sometimes “my 3rd and 4th toes are numb – is it diabetes?” Well, it’s not diabetes (in most cases). It is most likely a common condition called a Morton’s Neuroma, something foot and ankle specialists treat daily. The word neuroma in this case is actually a bit of a misnomer as as classic neuroma is a tumor of a nerve. A Morton’s Neuroma is a swollen, inflamed nerve located between the bones at the ball of the foot. It is usually between the 3rd and 4th toes but can be between any of the other toes. 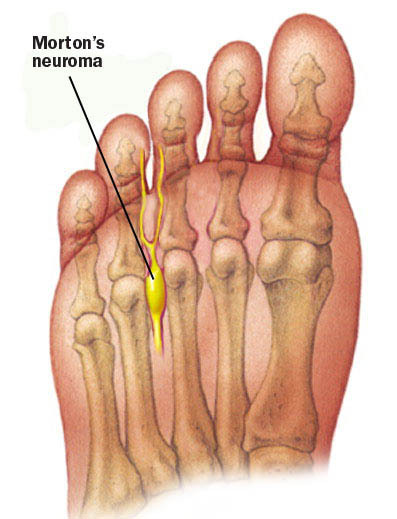 Morton’s Neuroma is usually seen in adults but is occasionally seen in teens. Women are more likely to suffer from a neuroma, likely related to the type of shoes they wear. Participating in high-impact athletic activities such as jogging or running may subject the feet to repetitive trauma which can also lead to a neuroma. Foot deformities like bunions, hammertoes and flatfeet can also be predisposing factors. A custom orthotic with a metatarsal pad included to relieve pressure from the neuroma is usually the first line treatment for Morton’s Neuroma. Steroid injections can also be very helpful to decrease the inflammation. Another kind of injection called a sclerosing injection (alcohol based) can also be used to deaden the nerve. These injections are usually given in a series (every 10 days or so – anywhere from 5 to 10 total). If conservative care fails there are also surgical treatment options. There are two kinds of surgery for neuromas: one releases the ligament compressing the nerve and the other involves removing the nerve. If you suspect you are suffering from a Morton’s Neuroma, consider scheduling an appointment at Texas Foot and Ankle Specialists. We are conveniently located adjacent to the La Centerra outdoor shopping center across from Cinco Ranch High School in the Katy area of west Houston. We have convenient hours to accommodate a variety of schedules and offer same day appointments for those with pressing needs.